Cupid is Stupid, says who? We do! No date for Valentine's Day? Who cares! 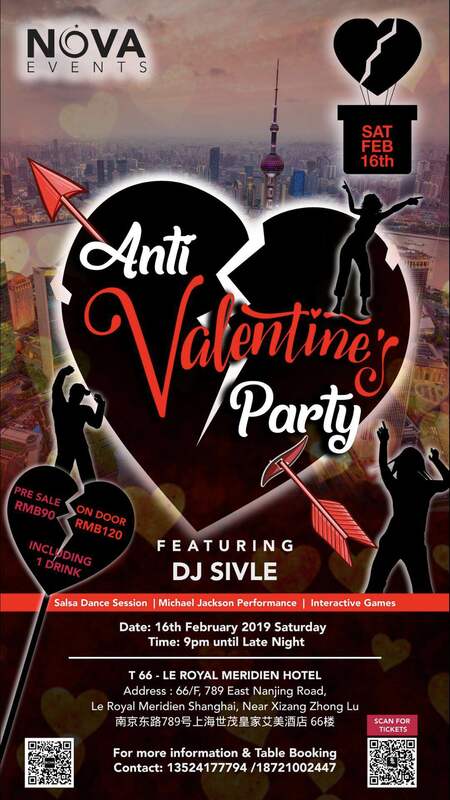 Nova Events brings you Shanghai's first ever Anti-Valentine’s Party. Mingle with a bunch of new people at one of Shanghai's best rooftop bar's. Located on the 66th Floor of Le Meridian Hotel, T-66 Bar has a spectacular view of the Shanghai skyline, DJ Sivle playing Latin house, Reggaeton, Hip-Hop and Afro beats, many fun games, a Michael Jackson performance and a Latin dance session.